Welcome on the HackYourPhD website! Here are some practical informations to navigate on the site and to better understand who is the HackYourPhD community and its actions. HackYourPhD is a community created in France in January 2013 by Célya Gruson-Daniel and Guillaume Dumas. 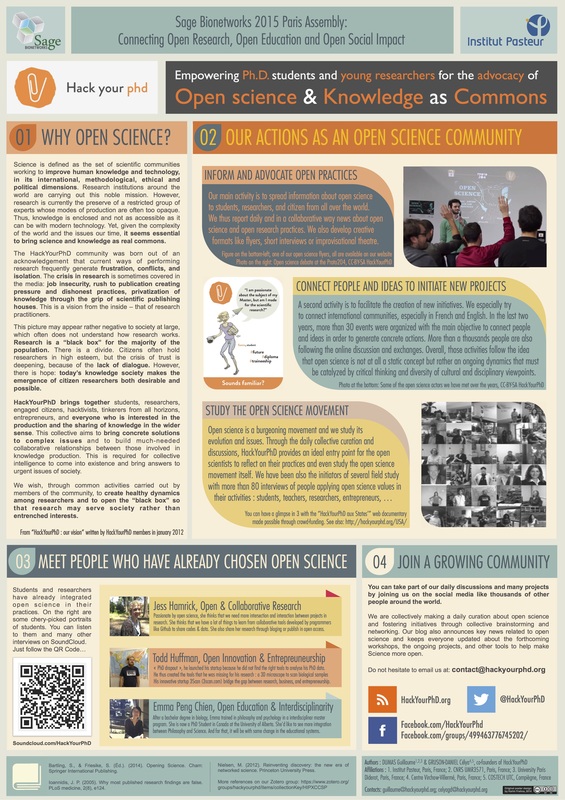 It gathers various profiles (researchers, PhD students and students, entrepreneurs, designers…) around the issue of Open Science. HackYourPhD wishes to explore the several facets of Open Science, in order to better define it and follow its evolutions. This exploration is made in a collaborative way under various formats. To know more and to meet the members of HackYourPhD: Discover the portraits of its members on Meet the team.